When it comes to naming the world’s fastest creature, it’s tempting to think of peregrine falcons, cheetahs, or marlins, but as researchers from Georgia Institute of Technology are apt to point out, we mustn’t forget Spirostomum ambiguum—a worm-like creature that reaches breakneck speeds through rapid shrinkage. 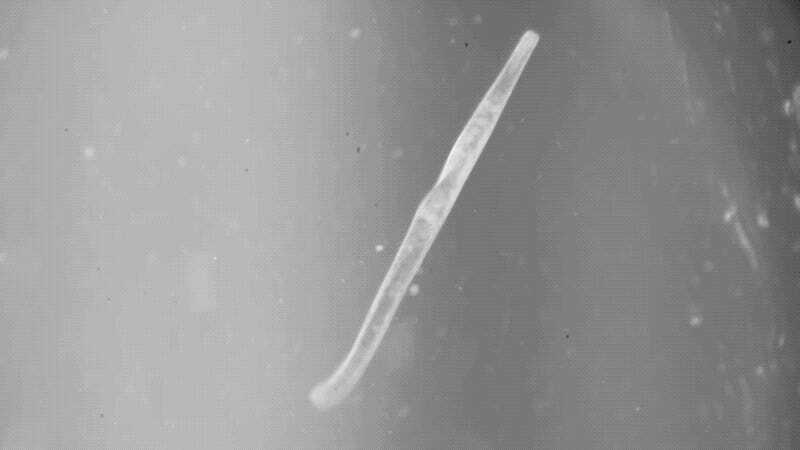 Spirostomum ambiguum is a single-celled protozoan that’s often found in lakes and ponds, and it typically moves around by using tiny cells called cilia. But when S. ambiguum is startled, the normally four-millimeter-long protozoan contracts its worm-like body with lightning speed, reducing the length of its body by more than 60 percent. It performs this rapid rate of shrinkage in just a fraction of a second; its transformation into a football-like object looks practically instantaneous to the human eye. Researchers at Georgia Tech’s School of Chemical and Biomolecular Engineering would very much like to solve this mystery, and a four-year research grant recently received from the National Science Foundation will surely help. It may sound quite esoteric to study the impossibly quick movements of such a tiny creature, but insights in this area could lead to advanced robotics and nanotechnology. Nature has clearly found a way—scientists just have to figure out the details. A batch of Spirostomum ambiguum. Larger vertebrates, whether they be cheetahs, birds, or humans, depend on proteins called actin and myosin to move. The same cannot be said for protozoans, who move by using tiny molecular springs, latches, and biological motors. What’s more, these mechanisms rely on the physics of the very small, and could not possibly translate to larger animals. Indeed, that’s an acceleration of 450 miles per hour per second, which is about 80 percent the acceleration of a frog’s tongue as it catches its prey, or about 73 percent the acceleration of an AIM-9E missile. To solve this mystery, Bhamla and his colleagues are going to throw some math at the problem. Success in this area could result in the development of molecular machinery and microbots that are capable of similar accelerations, and importantly, are able to survive the blazingly fast motion. As we all know, the cheetah is the world’s fastest land animal, but as a fun fact, the world’s fastest land animal relative to its size is Paratarsotomus macropalpis, a mite native to southern California. This creature can travel 322 body lengths per second, which for a human would be like running 1,300 miles per hour.